There are 27 boxes of Christmas cards in the John Johnson Collection and a further 7 of Christmas cards: trade. 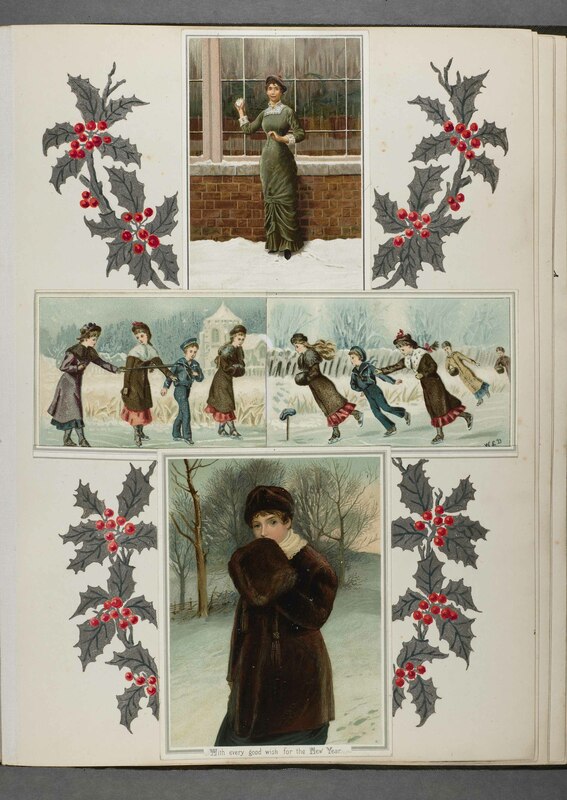 Christmas cards are also represented in our Albums, notably in a Jonathan King stock book, a S. Hildersheimer & Co. sample album (1880-81), and in a beautiful Hildesheimer & Faulkner competition album (1881-1882). This post aims to contextualise some of these cards. The Victorians are often credited with (or blamed for) inventing the modern Christmas. Before the Victorian era there was no continuing tradition of celebrating Christmas. In the church calendar Easter was the more important festival. However, as most Christmas celebrations have their roots in traditional, even ancient, British and European customs, the Victorian Christmas was in reality an amalgam of novelty and nostalgia. The Christmas card, however, was a true Victorian invention. The commercial Christmas card can be dated precisely to 1843, to a commission by Henry Cole (1808–1882, later knighted). Cole had worked with Rowland Hill on the Penny Post (1840) and was later famed for his contributions to the Great Exhibition and to the founding of the South Kensington Museum (subsequently the V&A) of which he was the first Director. The card was designed by John Callcott Horsley (1817–1903) and departs from the intricate lace paper and elaborate composition of the contemporary and well-established valentine. 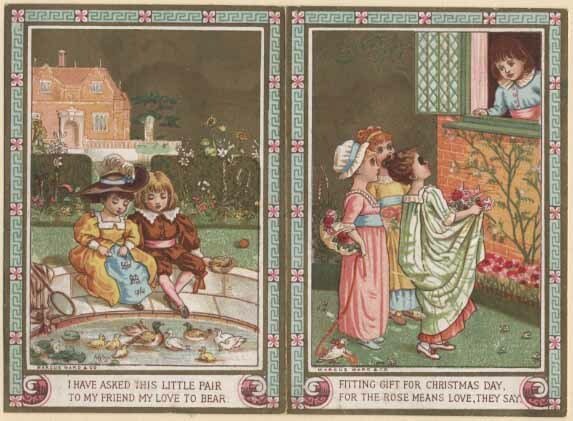 The hand-coloured design encapsulates the central elements of the Victorian Christmas in a pseudo-triptych. It shows a wealthy family toasting the viewer, flanked by two scenes of charitable giving to the poor. It is notably secular. Sadly, we do not have an example in the John Johnson Collection, so I refer you to the V&A’s excellent online article about the card. 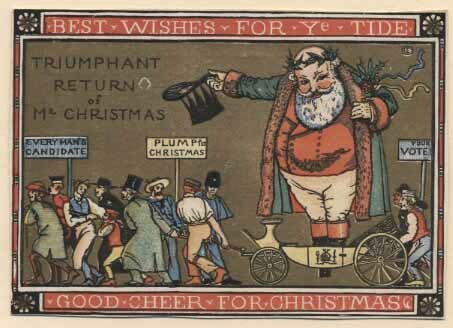 Despite good sales of the Cole–Horsley card (1,000 copies were lithographed and hand-coloured and those surplus to Cole’s personal needs were sold at his own shop, Felix Summerly’s Home Office, for the princely sum of a shilling each), the next commercial British Christmas card was not produced until 1848. 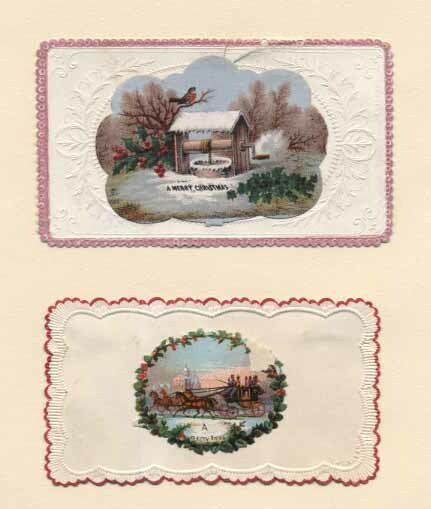 In the 1860s, Christmas cards were typically similar to visiting cards, with scalloped edges and small embossed images of robins, holly or flowers. Note headings with similar designs embossed at the top were also popular at this time with matching scalloped envelopes. 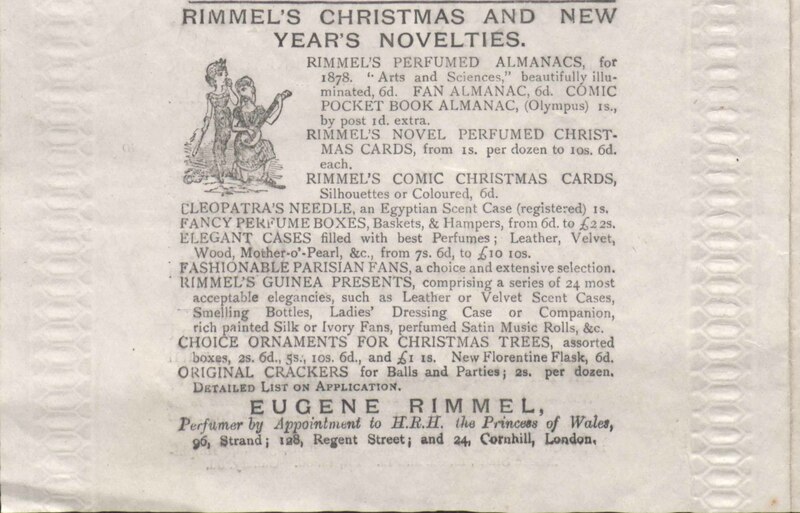 The newest cards from publishers such as Marcus Ward, Hildesheimer and Faulkner (both famed for their superior artwork), Sulman, and Rimmel (whose offerings were often scented sachets) were eagerly awaited and discussed in the press. Cards were usually single rather than folded sheets with printed verses and space for handwritten messages on the back. In the 1870s to 1880s, they became more complex, sometimes incorporating lace paper, decorative scraps, mechanical devices (cards with paper ‘springs’ to create a three-dimensional effect, or with strings to activate moveable parts or pop-ups), and gold and silver printing. They were the province of the wealthy, but were less expensive than valentines. Marcus Ward’s artists included Walter Crane (brother of its artistic director) and Kate Greenaway. Several publishers ran competitions for card design or artistic arrangement of cards in the albums that were so popular among women. It is surprising that, in such a pious age, the imagery of most Christmas cards was not religious (although the accompanying verses sometimes were). Certainly there were some nativity scenes, angels, crosses with flowers or religious sentiments, but these were well outnumbered by images of children, Father Christmases, wintry scenes, flowers (often looking forward to spring rather than winter), robins, food and anthropomorphic animals and birds. Humorous cards were also common. 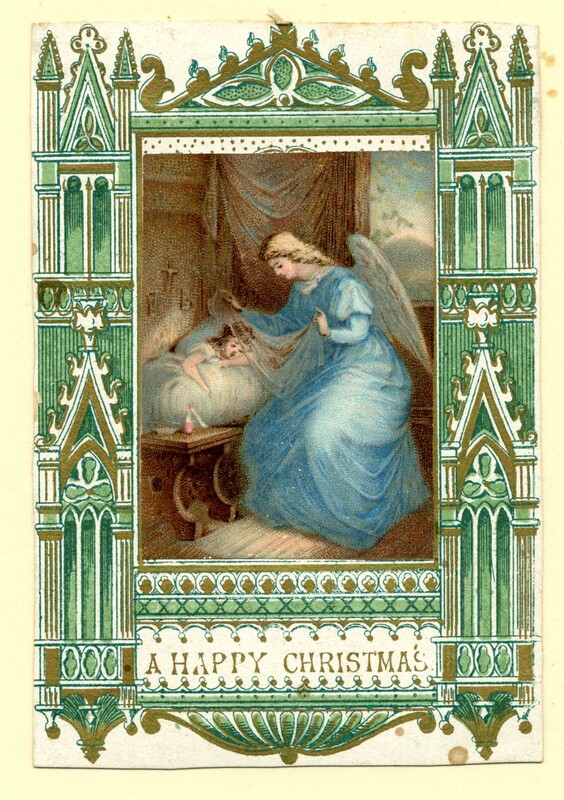 Did the Victorians find the secular nature of most of their Christmas cards odd? There is little evidence that they did. ‘The diffusion among one’s friends and relatives of things so well adapted to cultivate taste is a real Christmas Charity’ wrote Thomas Hood about Marcus Ward’s latest cards in the journal Fun. Church attendance (and charitable giving) would have been taken for granted, and the secular and the sacred seem to have co-existed comfortably. 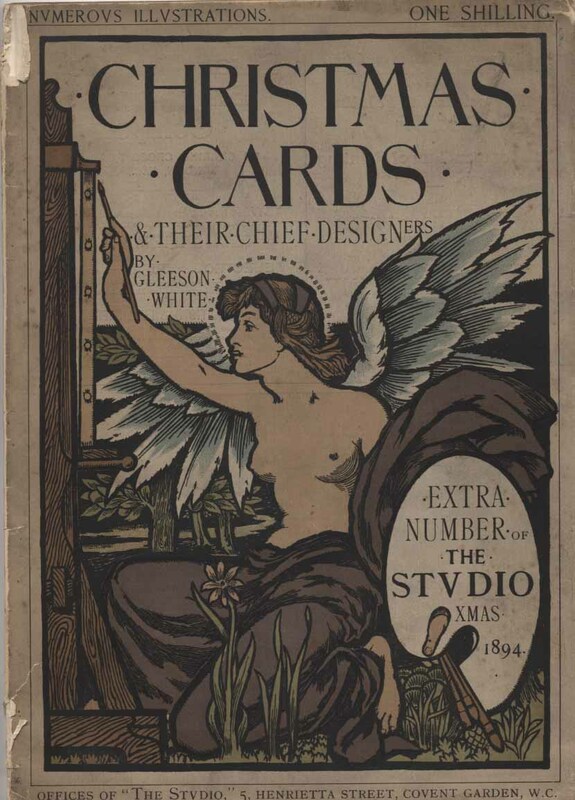 An invaluable contemporary account of Christmas cards is this extra number of The Studio, 1894. 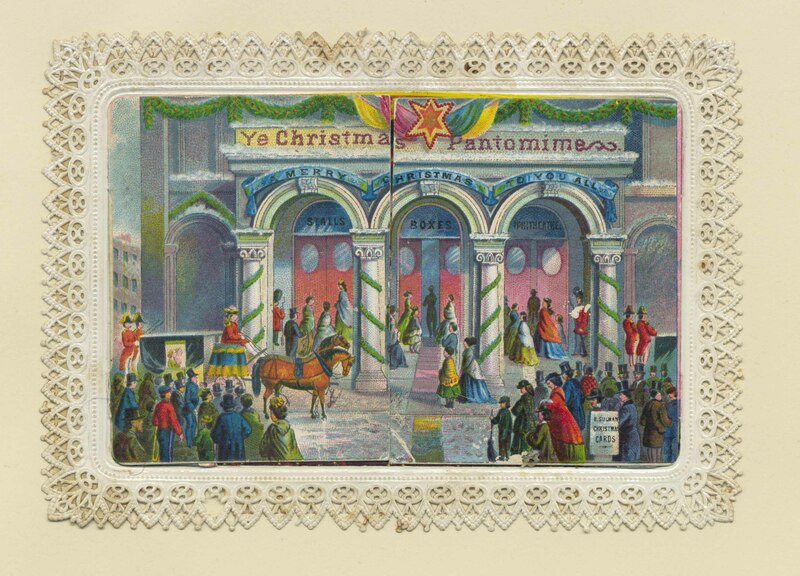 The Christmas card has continued in popularity, although the flights and fancies of Victorian invention and paper engineering have given way to much simpler, folded cards. A few years ago it was almost unthinkable that the Christmas card might disappear, despite the secularisation of greetings as well as images on some cards in order to avoid causing offence. However, environmental concerns and the viable alternative of the e-Card may result in its decline. As Librarian of the John Johnson Collection of Printed Ephemera (in the Bodleian Library), I find a gentle irony in the gradual substitution of the ephemeral by the e-phemeral!